"Lithops is the solo disguise of Jan St. Werner known for his work in Mouse On Mars, Microstoria and his most recent collaboration with Mark E Smith and Andi Toma as Von Sudenfed. 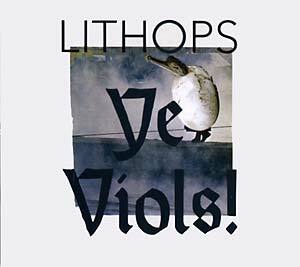 With Ye Viols!, Lithops presents a selection of installation soundtracks assembled from several recent exhibitions. Ye Viols! can be seen as background noise for a visual utopia: a recombined industrial iconography of spatial adventures, futuristic collages and phantasmagoric scenes. 'Graf' accompanied a slide show of architectural sketches about neo-modernist city scapes that was shown in Amsterdam. The masking of identities and deconstruction of the ego was the theme of 'Bacchus,' a series of drawings and photo collages by Illui Nonobac. The cover artwork and enclosed poster supplement of Ye Viols! are taken from that series. Nonobac's images are collages of hybrid creatures: animals, plants, and humans that have been further modified by additional drawings. A three-channel version of 'Bacchus' was continuously played during the show. 'Handed' premiered in the sound bowl of the Project Arts Centre in Dublin as an accompaniment to an exhibition by Rosa Barba and David Maljkovic. 'Decay objects. Incredibly fast moving objects. Invisible objects.' is a speaker installation for which parts of the track 'In Nitro' were used. 'Apps 1 & 2' is derived from another soundtrack for a 35mm film installation by Rosa Barba. Lastly, 'Inductech' was used for a dance performance by young Korean choreographer Lee Yaung. Although the works were created for these installations, their dense and layered sounds and creative structures manifested by Werner allows the pieces to stand alone as musical works whose details continue to reveal themselves with each listen. 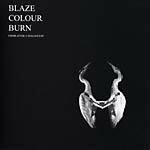 The album is released in a limited edition CD with hand printed cover using recycled paper and vegetable inks."